Kim Jong Un is the thirty year old dictator of North Korea, best known for continuing the development of nuclear weapons with which he threatens to destroy South Korea and the United States, conducting public executions, maintaining prison camps for political prisoners, and starving his people while the elite live lavishly. Dennis Rodman is a former basketball player who won five NBA Championships, was Defensive Player of the Year twice, and a member of the NBA Hall of Fame. He is known as perhaps the greatest rebounder ever to play the game, as well as for his bizarre hair styles, tattoos and body piercing. He publicized his first autobiography by showing up in wedding dress and his second by appearing in a coffin. He is a certified headcase and publicity whore. Last week, Rodman was in North Korea with the staff of Vice Magazine, which is filming a special for HBO. Rodman and the Vice crew, the first Americans to meet Kim Jong Un, were guests at an exhibition game featuring members of the Harlem Globetrotters and a sumptuous banquet that Rodman described as top tier. I wonder how the 3.5 million people who’ve starved to death in North Korea since 1995 would feel about that. Returning home, Rodman said that Kim Jong Un is a great leader. I love him, Rodman said. Dumb. Rodman: He likes basketball. Obama likes basketball. Let’s start there. He wants Obama to do one thing: Call him. Stephanopoulos: He wants President Obama to call him? Rodman: He’s a great guy. He said, ‘I don’t want to do war. I don’t want to do war.’ He said that to me. Stephanopoulos: He’s a great guy who’s put 200,000 in prison camps? Rodman: Guess what? We have prison camps here too. But here’s what really makes me nuts. Stephen Kessler on the Huff Post Blog said, I was struck by the devastating common sense wisdom the five-time NBA Champion brought to his role as an accidental international diplomat when he spent time with North Korean supreme leader Kim Jung Un. In a Tweet, Stephanopoulis offered this: No hate here for @dennisrodman. 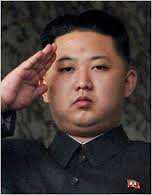 Hope #KimJongUn proves he’s right with deeds. Seriously, George? And beneath the CNN article describing Stephanopoulis interview with Rodman, comment after comment like this: So what? If it gets the job done, why not use basketball players instead of politicians? … I don’t think Rodman is dumb! I think he is doing a good thing going to North Korea! … And if North Korea opens up because of the efforts of Dennis Rodman. Then what? Dumbest. So, as you probably know, it’s Top Sites Tuesday #193, and if I want to participate, I have to glean Two Thoughts on Tuesday from this rant. Easy. Thought Number One: Why does our media oblige publicity seeking celebrities? Could it be because they are publicity seeking media whores? Yeah. And Thought Number Two: I gotta stop reading comments on news stories … it scares the hell out of me. I’d like to hear what you think … after you push my button … gently … to make me Number One on Top Sites Tuesday #193. This entry was posted on March 5, 2013 at 12:17 am and is filed under curmudgeonly rants. You can subscribe via RSS 2.0 feed to this post's comments. Unfortunately, the minute I saw the Rodman was involved, I quit paying attention as I tend to write him off, as you aptly put, a celebrity whore. Now I wish I would of been paying closer attention. I really don’t think we need a nut bag like Rodman (who by the way, I don’t deem as super intelligent) acting as an emissary for the US. Love your take using the dumb, dumber,dumbest.breakdown. You really are creative in your writings. I always enjoy reading your posts. After I read some of the comments on the news articles, I was ready to pull my hair out (well, I would be if I had any) they were so dumb. Do you think we’re dumber as a people or that the internet just provides more of a place for the dumber among us to show it off? Thanks for the compliment. It means a lot coming from you. You are right that there seems to be an abundance of pure nosense always pouring forth on the Internet. I guess it is a forum that by it’s anonymous nature let’s people spout off. A shame really that many don’t feel the need to research the facts at all. You are welcome…sincerely..yours is one of the best, thought provoking blogs on the web. Dennis Rodman? Really? The new dictator’s choice of people he speaks to first includes Dennis Rodman? And then said guy tosses his hat in the ring of politics? You’re right. It’s Dumb. And the media probably shared it across all the news channels like it’s a hot topic instead of something that should have never happened. I don’t watch tv much while we travel and I may not be very politically inclined, but what a bunch of malarkey. I like beer and the President likes beer so maybe he should call me? I can think of better ways to open up communications between our countries, Dennis Rodman is not included in any of those ways. I rarely pay attention to Dennis Rodman, for openers although I did see a blurb about this event and immediately wrote it off with pretty much the same thoughts as you expressed about this in this post. I added the words “idiots,” “idiotic” and something additional with the “f” word in front of those words -my own version of dumb, dumber and dumbest, you could say. I wonder what Dennis thinks today, as his best friend threatens to engulf Washington DC in a sea of fire with a nuclear attack.